Painter Nichole Gronvold Roller (solo exhibit '18) selected for a solo exhibition at the Dubuque Museum of Art in 2020. BoxHeart returns to Los Angeles for exhibition at LA ART SHOW 2019 with a collection of works from returning exhibitors Joshua Hogan and Daria Sandburg as well as LA first timers Gavin Benjamin (solo exhibit '20) and Augustina Droze. 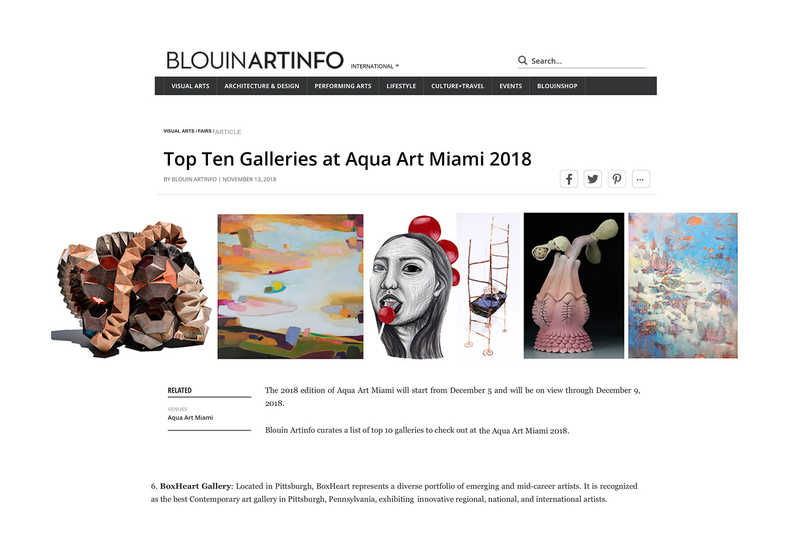 BoxHeart included on BlouinArtInfo's list of "Top Ten Galleries" exhibiting at AQUA ART Miami Beach 2018. BoxHeart returns to Miami for exhibition at AQUA ART Miami Beach 2018 with a collection of works from returning exhibitors Joshua Hogan, Andrew Ooi, and Daria Sandburg as well as Miami Beach first timers Sara Catapano, Hannah Pierce, and Nicole Renee Ryan. Biophilia Enhanced Through Art (BETA) project expanded in the fall of 2018 to Phipps Conservatory's Exhibit Staging Center. Artwork by Hiromi Katayama (solo exhibit '19) and Sylvester Damianos (exhibit '17) selected for the BETA Collection. BoxHeart selected to exhibit at the 2018 Fall Edition of the AFFORDABLE ART FAIR in New York City with exhibiting artists Augustina Droze (solo exhibit '18), Joshua Hogan, Andrew Ooi, and Nicole Renee Ryan. BoxHeart partners with SUPERFINE! DC to present Heartlandia - a curated section of 13 North American galleries with programs committed to exhibiting artwork by new contemporary artists with individuated vocabularies. Hailing from regional art capitals of the future including Ottawa, Philadelphia, and Wichita, the exhibiting galleries of Heartlandia set the curatorial tone of Superfine! DC by exploring the intricate patterns of creative hybridity that are powering a cross continental art revolution. Exhibiting artists: Sara Catapano, Seth Clark, Kyle Ethan Fischer, Annie Heisey (solo exhibits '20/'17) Joshua Hogan, Heather Kanazawa, Andrew Ooi, Hannah Pierce, Crista Pisano. Daria Sandburg. BoxHeart returns to NYC for SUPERFINE! Art Fair 2018, the 2nd edition of the Superfine! Art Fair to hit NYC with exhibiting artists; Andrew Ooi, Sherry Rusinack (solo exhibits 18'/13), Nichole Gronvold Roller (solo exhibit '18), and Nicole Renee Ryan (solo exhibit '18). Ceramic artist Sara Catapano featured on HiFructose. "Ephemeral" a MFA Thesis Exhibition featuring ceramic artists Sara Catapano (solo exhibit '18) and Hannah Pierce (solo exhibit '18) was one of twenty-one projects selected as a Concurrent Exhibition during the 52nd Annual Conference of the National Council on Education for the Ceramic Arts (NCECA), CrossCurrents: Clay and Culture, which takes place in Pittsburgh March 14 - 17, 2018. BoxHeart is honored to have been selected as part of LA ART SHOW'S crowd-favorite "Littletopia" section. "Littletopia" offers an accessible mix of works from emerging voices and is consistently among the most-trafficked areas of the fair. Distinguished as the West Coast's foremost celebration of the visual arts, LA Art Show's upcoming 23rd edition includes the participation of The Broad, LACMA, The Hammer, MOCA, and The Getty. BoxHeart returns to Miami for exhibition at AQUA ART Miami Beach 2017 with a collection of works from returning exhibitors Seth Clark, Kyle Ethan Fischer, Joshua Hogan, Irina Koukhanova, and Daria Sandburg as well as Miami Beach first timers Andrew Ooi, Crista Pisano (solo exhibits '19/'13), and Heather Kanazawa (solo exhibits '20/'17). Glass artist Jason Forck (solo exhibit '18) and collage artist Seth Clark (solo exhibits '20/'17/'13) collaborative series "Dissolution" invited for exhibition as a special project at SOFA2017. Forck also exhibited with the PGC: Idea Furnace at SOFA2014. Painter Joshua Hogan (solo exhibits '19/'16/'13/'09/'06/'01) one of twenty-eight artists selected for the exclusive partnership between Crate and Barrel and UGallery to present artwork from top emerging artists on the Crate and Barrel online platform. BoxHeart exhibited at Superfine! Art Fair 2017, the first rendition of the SUPERFINE! Art Fair to hit NYC. Hand-painted and free folded paper artist Andrew Ooi (solo exhibit '19/'17) selected for exhibit at SOFA2017 with Option Art Canada. Collage artist Seth Clark (solo exhibits '20/ ’17/’13) artwork selected for exhibit at ART ON PAPER, NY with Paradigm Gallery Philadelphia in 2017. Mixed media artist Kyle Ethan Fischer (solo exhibits 12/’09) was the lead sculptor on the Motion Picture Where'd You Go, Bernadette?. The production features his large-scale, sculptural artwork as props and set installations. Painter Alice Raymond (solo exhibit '20/’17) selected for New American Paintings Issue #127 Pacific Coast in 2017. Painter Joshua Hogan (solo exhibits '19/ ’16/’13/’09/’01) selected for representation by The Vault Gallery in 2017. BoxHeart exhibited at AQUA ART Miami Beach 2016 alongside 47 international exhibitors showcasing fresh new works, and set in the intimate exhibition rooms found within the classic South Beach Aqua Hotel. The exhibition "Ashley Cecil, Augustina Droze, and Deirdre Murphy : Emergent Patterns" (3 person exhibit '16) was featured in Widewalls Magazine, the Pittsburgh Post-Gazette, and Pittsburgh Magazine. The exhibition celebrated wise conservation, specifically the Migratory Bird Treaty Act, bringing into focus a generative and incisive dialogue regarding the patterns found in collective behavior and the significance of chance observations through innovative forms of expression. Free folding paper artist Andrew Ooi (solo exhibit '19/'17) artwork selected for exhibit at SOFA2016 with Option Art Canada. Michael Walsh's (solo exhibit '16) The Cosmic Carousel exhibited at the Bay Area Maker Faire and featured in Architectural Digest for Innovative Design, a Work of Sci-Fi Art. Collage artist Seth Clark (solo exhibits '20/ ’17/’13) artwork selected for exhibit at ART ON PAPER, NY with Paradigm Gallery Philadelphia in 2016. Irina Koukhanova (solo exhibit ’14) was a Creative Workforce Fellow 2016. The Creative Workforce Fellowship is a program of the Community Partnership for Arts and Culture, made possible by the generous support of Cuyahoga County residents through a public grant from Cuyahoga Arts & Culture. January 2016 was the anniversary of the "15th and final Art Inter/National Exhibition", an exhibition that explores how our world influences the artistic process and how the artist influences our world. The annual exhibition has featured artists from over fifty countries including: Angola, Bulgaria, Canada, Chile, China, Colombia, Ecuador, France, Georgia, Germany, Korea, India, Iran, Israel, Italy, Nigeria, Norway, Peru, Vietnam, Switzerland, Turkey, and the United States. Painter Alice Raymond (solo exhibits '20/ ’17) artwork selected for exhibit at MIAMI PROJECT with Jack Fischer Gallery, San Francisco. Irina Koukhanova (solo exhibit ’14) received a Cleveland Foundation Grant, "Creative Fusion", in collaboration with the CSU Sculpture Program in 2015. Curatorial proposal “The Unspoken” exhibited at the Penn State New Kensington Art Gallery June - September, 2015. “The Unspoken” features eight artists working in visual collaboration. Mixed media artist Kyle Ethan Fischer (solo exhibits ’12/’09) was the lead sculptor on the Motion Picture The Last Witch Hunter which was released October 23, 2015. The production features his large-scale, mixed media sculptural artwork as props, set installations, and wardrobe. Nzuji De Magalhaes (solo exhibit '20/’05) exhibited at the Hammer Museum, the Santa Monica Museum of Art, and the California African American Museum in 2015. Seth Clark (solo exhibits '20/ ’17/’13) was named “Pittsburgh’s 2015 Emerging Artist of the Year”. Completed the project Biophilia Enhanced Through Art (BETA)in the spring of 2015. Curated and managed the selection of large-scale, site specific artwork at Phipps Conservatory's The Center of Sustainable Landscapes. Acrylic Construction artist Kal Mansur's (solo exhibit ’16) artwork selected as one of the 2015 Architectural Digest Home Design Show's most exciting new products. Painter Kuzana Ogg (solo exhibits ’15/’13) exhibited at the Bakersfield Museum of Art in 2015 and the San Luis Obispo Museum of Art in 2014. Multi-media artist Irina Koukhanova (solo exhibit ’14) exhibited at both the Snite Museum of Art and the South Bend Museum of Art in 2014. Abstract painter Joshua Hogan (solo exhibits '19/ ’16/’13/’09/’01) selected for representation by UGallery in 2014. Painter Erin Treacy (solo exhibits '20/’15/’11/’09) received a Fulbright Fellowship in Painting as well as residencies at the Sam and Adele Golden Foundation of the Arts and the Vermont Studio Center. Curatorial proposal “The Way and The Wayfarers” exhibited by The Westmoreland Museum of Art in 2014, featuring artists Joshua Hogan (solo exhibits '19/ ’16/’13/’09/’01), Jay Knapp (solo exhibit ’14), and Kuzana Ogg (solo exhibits ’15/’13). Seth Clark (solo exhibits '20/'17/'13) selected to exhibit in the 2014 Pittsburgh Biennial. Mixed Media artist Isabelle Garbani (solo exhibit '11) artwork selected for exhibit at SCOPE ART FAIR, NY with Chashama NY. Mixed Media artist Meghan Olson (solo exhibit ’13) and collage artist Seth Clark (solo exhibits'20/ ’17/’13) selected for New American Paintings Issue #110 Northeast in 2013. Nzuji De Magalhaes (solo exhibit'20/ ’05) selected to create public artwork for the Santa Monica Bundy and Exposition Metro Station in 2012. Curatorial proposal “Urbanic III” exhibited by Future Tenant Gallery in 2011. Curatorial proposal “Urbanic II” selected by The Pittsburgh International Airport and exhibited in conjunction with the G-20 Summit in 2010. Comprehensive Public Art Plan “Connecting Community to a World of Visual Knowledge” selected as a finalist for the Pittsburgh Penguins’ Sports Arena in 2008. Mixed media/textile artist Nzuji De Magalhaes (solo exhibit '20/’05) selected and exhibited by the Harlem Studio Museum in New York City as part of “Frequency” an exhibition organized by Thelma Golden and Christine Kim who selected thirty-five of the hottest, emerging, black artists from around the world. Her artwork was purchased for their permanent collection. Video-sound installation artist, John Henry Blatter (solo exhibit ’04) created the zine, The Daily Constitutional, which featured artists taking back their forum and writing about art themselves. Ilana Raviv’s (solo exhibit ’04) paintings became part of the permanent collection of the Holocaust Memorial Museum in Washington D.C. and the International Convention Center in Jerusalem Israel.